It's all about paying respect and preserving a tradition. This photo taken on Aug. 7, 2016, shows Eli Mabel of the Dani tribe holding the mummified remains of his ancestor, Agat Mamete Mabel, in the village of Wogi in Wamena, the long-isolated home of the Dani high in the Papuan central highlands. Eli Mabel of the Dani tribe (see more remarkable photos below) spends many nights in the hut where the mummy is kept to make sure nothing happens to it, he told Agence France-Presse. 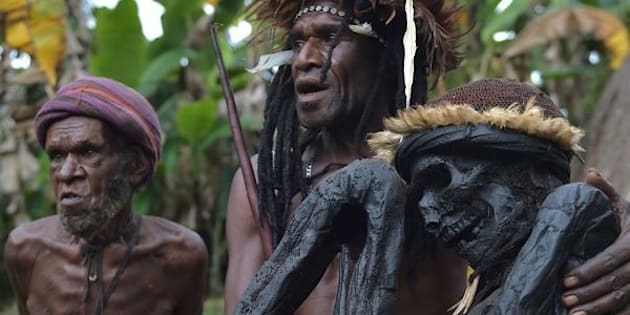 To mummify the bodies, the Dani people dried them under the sun and then stashed them in a cave, Dr. Semiarto Aji Purwanto, a lecturer in anthropology at the University of Indonesia and an expert on Dani culture, told The Huffington Post in an email. Next, he said, the remains were exposed to hot smoke, drained of liquified fat through piercings and slathered with lard. The entire process took months. Mummification was once common among the Dani but died out after Christian missionaries who came to the area 30 to 50 years ago encouraged them to bury rather than mummify their dead, Purwanto said, adding that only six or seven mummies are left.